I’ll never look at TV news the same: while the camera doesn’t really lie, neither does it always paint a full picture of what’s happening around the world. Take Waco: it’s not all biker gang wars, though that certainly got big coverage. 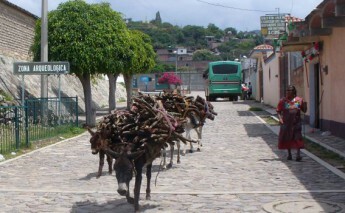 Or Oaxaca, whose election woes have been in the news. 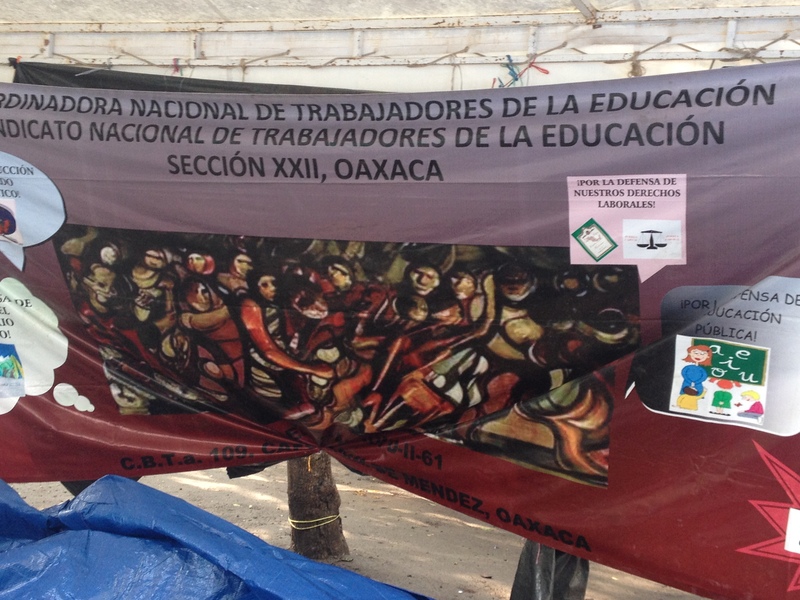 The mood in the days leading up to June 7 mid-term elections was definitely uneasy: federal officials had said that the state of Oaxaca was their primary concern for election violence, primarily because the CNTE (Coordinadora Nacional de Trabajadores de la Educación) teachers’ union Section 22 is actively militant here. 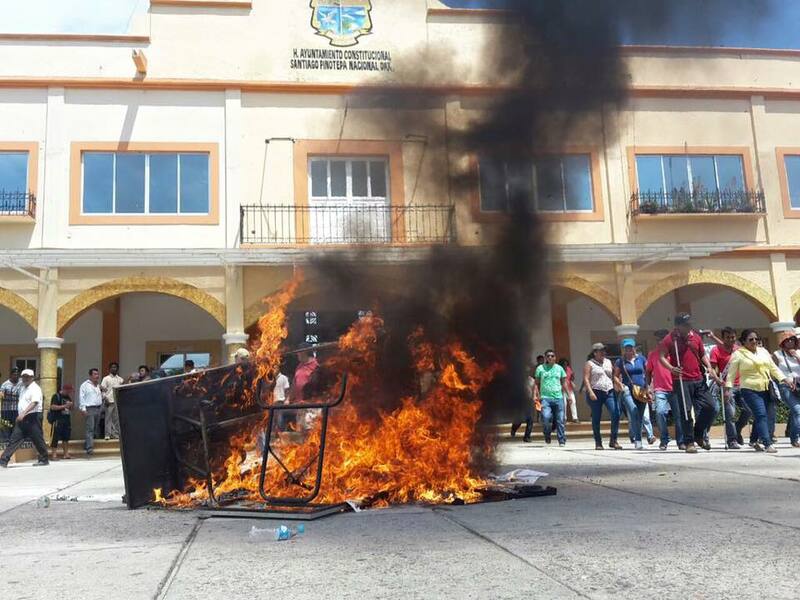 One official was quoted as saying that even the narcotraficantes haven’t tried to stop elections before: this is a whole new level of protest threatened by the teachers. My Mexican friends and neighbors were already talking about how they were in fact too intimidated to vote – looking to be the desired response from the union. On Monday, the stakes grew even higher. 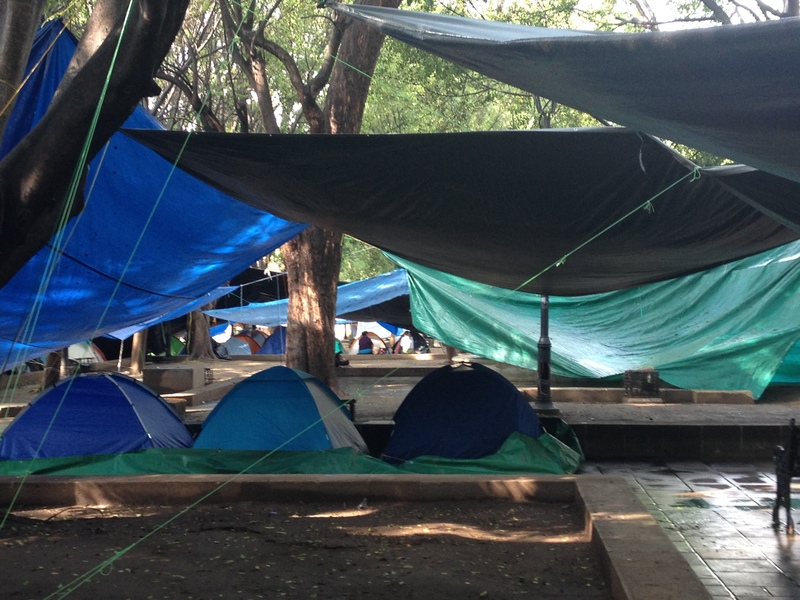 Section 22 teachers have been camping out in the zocalo of the city for a whole year, in a stand-off with the government about proposed educational reform that includes standardized evaluations which they vehemently oppose. 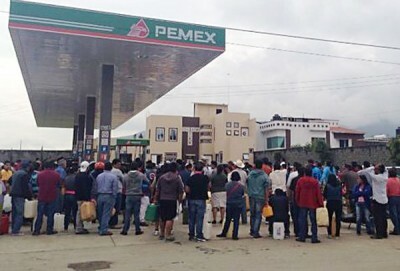 On Monday, protestors occupied a Pemex storage and distribution facility just outside Oaxaca City, cutting off gasoline delivery to all of the city’s gas stations. Without gas, public transportation – on which nearly everyone depends to get to work and school— fell by 30% the first day, 60% the second. On Wednesday, protestors occupied the airport, cancelling all ingoing and outgoing flights. By Thursday, black market gas (where it could be bought, in two-hour lines from stations outside the city perimeters at 2 a.m.) was upwards of $100 pesos a liter rather than the normal $15. Teachers occupied the ADO first-class bus station and formed a human tourniquet on the highway from Mexico City to Oaxaca in an attempt to prevent the feds from bringing in martial law. INE (the national electoral institute) had been running TV commercials all week, with smiling faces of all ages and ethnicities urging all to vote. It’s your right! You have a voice! By the end of the week, teacher union representatives had broken into INE offices around the state and burned thousands of ballots, vowing that they would do everything in their power to prevent people from voting. Even the government removing the educational reform rider from the Sunday ballot (saying that it was unrelated to anything) didn’t stop the threats. 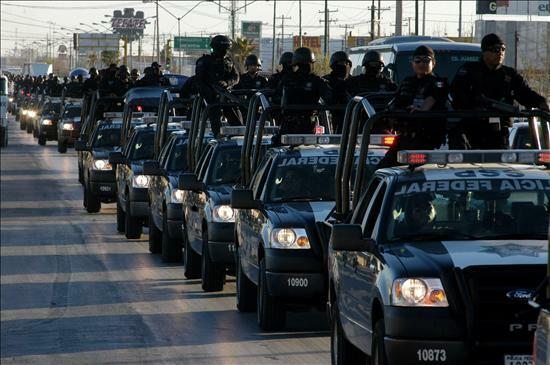 On Saturday, the Facebook page All Oaxaca posted photos of truck and plane loads of federales coming to keep the peace – newspaper reports variously said 1,000, 7,000 or 13,000 troops – and then it was Sunday, election day, dawning clear and cool after a heavy all-night rain. José and I took an early motorcycle ride around town to check out the situation; it looked pretty much like an ordinary Sunday. The first thing I noticed was an abundance of giant flying ants, chicatanas, that are such a temporary gourmet delicacy in the rainy season, all over the streets in the mud puddles. I had them once on tacos and wasn’t in a hurry to run out and trap them; I already had comida prepared for the day because I didn’t know what it would hold. There were still fewer vehicles than normal on the streets because of the gas shortage, otherwise it looked like business as usual. The only sign of the federales was one truck carrying three soldiers down near the 20 de noviembre market, and two on foot buying groceries in a supermarket. Two polling places, one at Parque Consatti and one at Abastos, had a line of about a dozen people each, but it was still only an hour or so after the polls had opened. A sign read “vote freely and safely.” The tamale vendors look to be doing much brisker business than the polling stations, and the huge fleet of Domino’s Pizza delivery motorcycles totally trumped the few pair of local police on theirs. 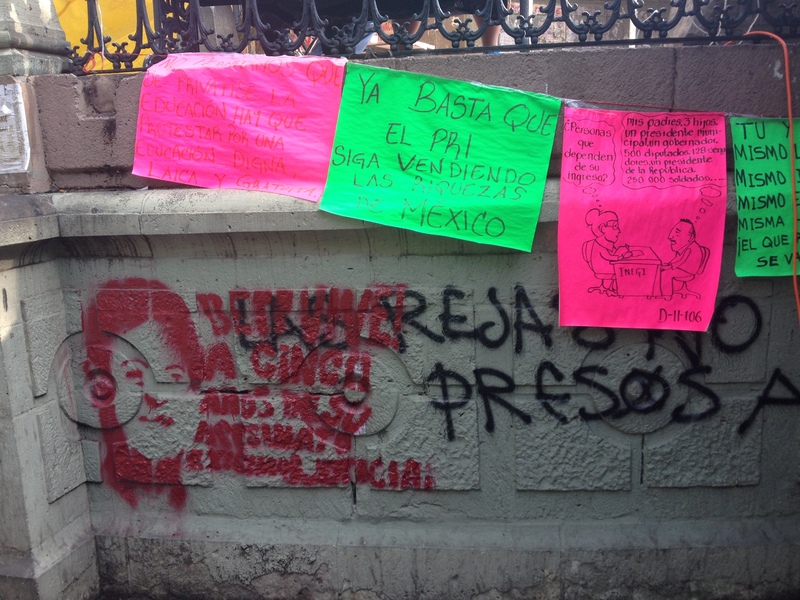 In the zocalo, the teachers’ squatter city of plastic tarps drooped from the night’s heavy rain; the paint from posters of militant slogans ran a little onto the sidewalk. One protestor lay half in and half out of his tent, furiously texting on a tablet that was plugged into an extension cord hooked up to . . . whose source of electricity? 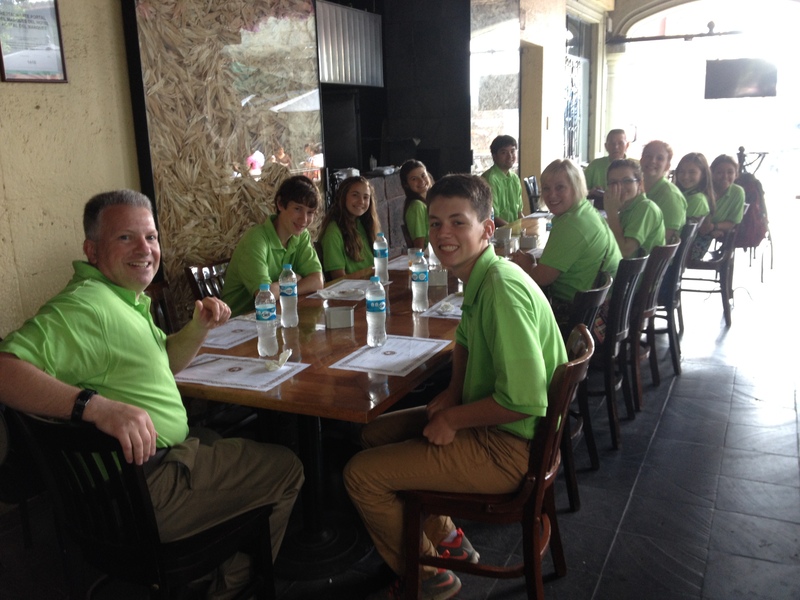 The restaurants around the square were mostly empty, though a group of Catholic youth missionaries from Michigan was breakfasting in matching lime green shirts before heading up to the Sierra Norte for a week. They were hoping to get out of the city before much happened, they said. At Abastos market, the only thing that seemed out of place to me was Moises, the local homeless drunk in my neighborhood far to the north, shuffling down the street far from his regular stomping grounds, though wearing the same filthy overcoat he always does. 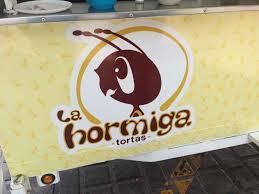 Later in the day at Parque Consatti after polls closed, La Hormiga’s (The Ant) mobile torta stand was still doing brisk business, the little namesake ant’s eyes looking more forlorn than ever. 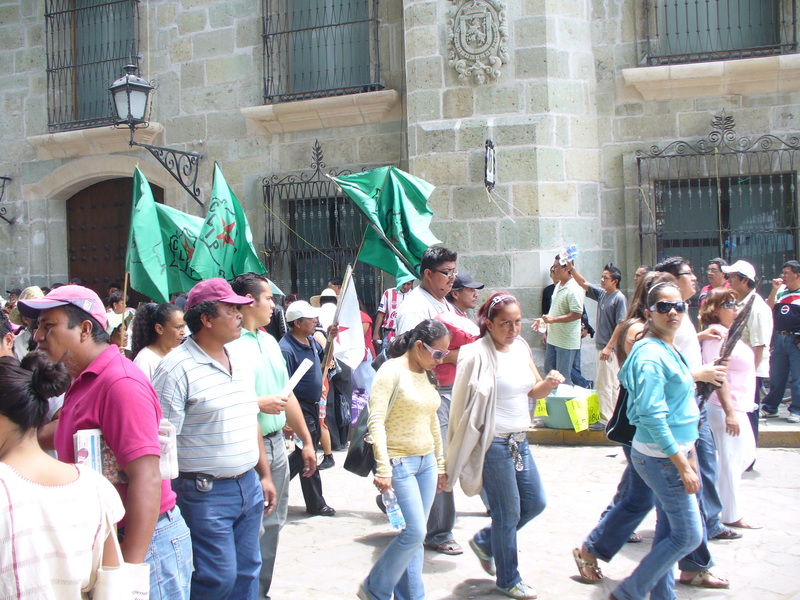 But there were pockets of problems that popped up during the day, in a weird sort of surrealism that juxtaposed the normal (people going about their daily business, which in Oaxaca often includes protesting) with the decidedly outside-of-normal. Helicopters buzzed noisily overhead: blue for the federales, green for the army and camouflage for the Marines. Who’s to say whether they were just announcing a military presence or patrolling the situation below. 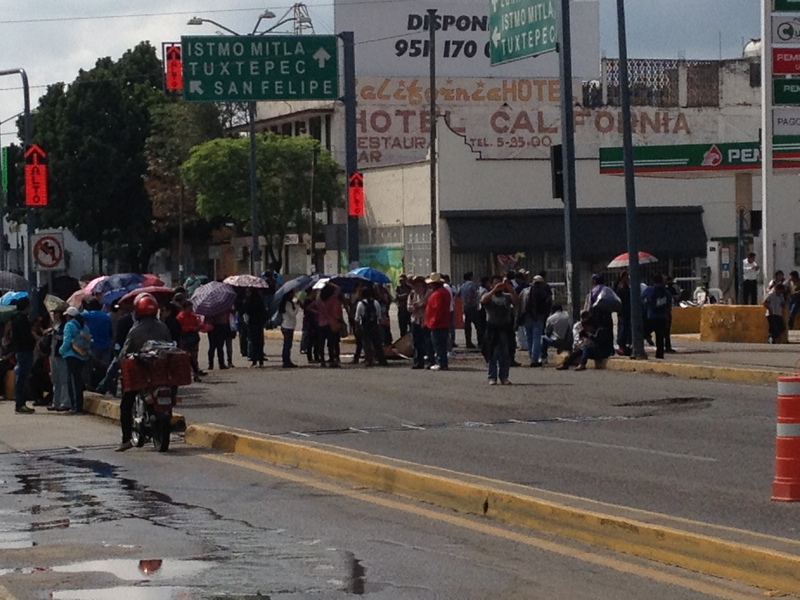 A group of teachers demonstrated in front of the Pemex station at Juarez and Chapultapec, maybe 100 people), shouting and waving placards – which I saw personally when I walked home in the next block. I saw on Facebook news that they later set fire to ballots in the street. The protestors marched down Avenida Juárez and it got a little ugly when they slingshot and threw rocks against the windows of the VIPS restaurant across from Parque Llano where several gringos hit the floor (this first-hand from a friend who was there). They even tried to throw a barrel through the window, but it didn’t break and the marchers didn’t try to come into the restaurant. José was at work looking out the window when he saw a truckload of masked men circle the block in a truck, then dash inside the market/polling place and run out with the ballot box. 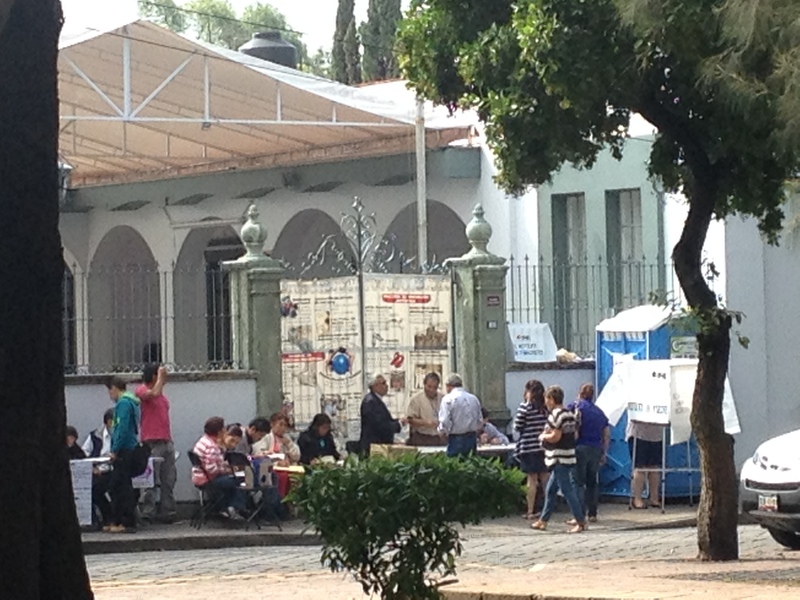 Evidently they took the box from the Consatti polling station too and then burned all the ballots in the zocalo. Where the federal soldiers were I don’t know, but they weren’t at the polling stations where the vandalism occurred. At the end of the day, the government reported that “elections all over the country went well with only small and isolated problems.” On Sunday evening, when we ventured out for a walk and a spot of Frisbee throwing, Santo Domingo plaza looked absolutely normal. There was no report on the news except of election results, though INE commercials urging people to vote played long after the polls had closed, another example of why people are fed up with how their tax dollars are spent. The day after the elections—at least in my neighborhood – people were doing a little post-mortem analysis on what’s wrong with both sides of the equation and how they’re sick of the government-teacher peeing contest that just interrupts their daily lives. Obviously there are two sides of every argument, including this one – but no one is on board with the tactics being pulled by either. 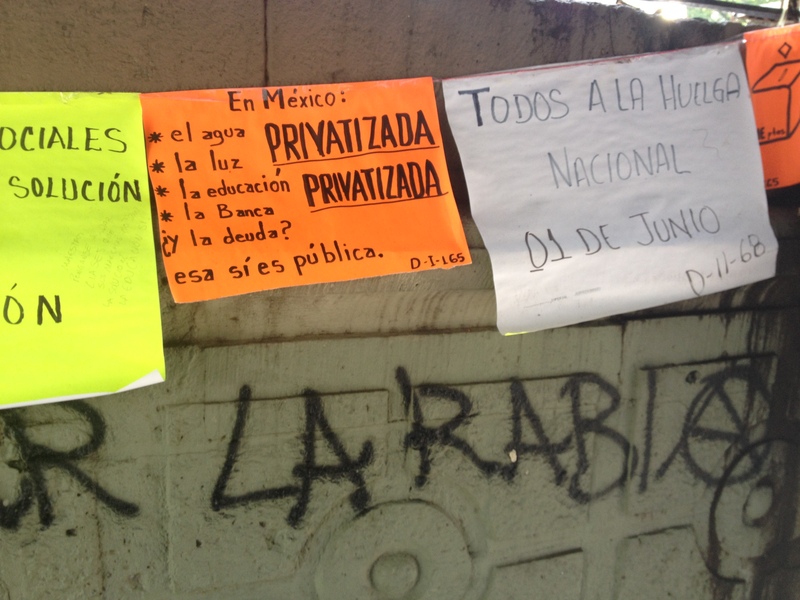 In Mexico: water, electricity, education and banks: privatized. The debt? That’s public. All I have to say is that the view from inside is probably always different from the outside news and it’s really hard to know what’s going on. Keep that mind next time you see a situation brewing in say, anywhere in the world – it’s likely not nearly as bad as it looks. Yes, things were a bit tense here on election day, but I never felt in any real danger. Part of living in a foreign country in constantly assessing where you should and shouldn’t be, mostly from a standpoint of common sense. Which was the real picture of Oaxaca on Sunday? Protestors throwing rocks and burning ballots in the streets? The street vendor nursing a baby from her rebozo and holding out flowers as we stopped at a stoplight on the motorcycle? How do you put those together for a complete mosaic of the truth? 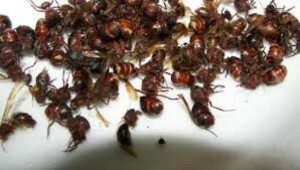 On the local news Sunday evening: it’s time go out and capture chicatanas for a little gourmet flying-ant eating. No thanks. Though I love Oaxaxa, they’re just something that leaves a bad taste in my mouth. Great post. There is SO much fear that is unnecessary in this world thanks to sensationalised news. Good to be reminded of that.